Less work in the "I don't have another second of my day to sit down and research what the heck is wrong with my crops" kind of work. The Amish Farmer John Kempf is educating his community of farmers in a simple lesson, if the soil is healthy and well balanced, that plants will have what they need to withstand stressors from disease and fungus. YES! This is at the core of what we believe at Deep Roots Farm. That is why no man made chemicals are ever used on our farm. No way, not a chance. We know that what we do isn't a perfect science, but we also know that there will be failures and losses. We do what we can to make sure our soil is healthy, giving plants the best chance at survival and in return we reap the reward of fresh, healthy, nutrient dense, delicious food in the end. Give some love to The Atlantic article about Kempf here. Kempf runs an educational website called 'Advancing Eco Agriculture' and it has a lot of information about the basics. I see that this farmer has a bright future leading the way towards better farming. I say the 'end' because there is still a lot to do to finish putting the farm to bed and we'll be attending four more winter markets at the 1912 Center in Moscow and give a beginning farmer workshop at the Idaho Center for Sustainable Ag Symposium. But the bulk of the season is over. Now is our time to rest, rejuvenate and plan for next season. We begin planning right away. On our end of the season trip, the first thing we do in the car is make a list. What worked, what didn't, what do we each want to change. Then we rank each item in a scale of 1-5. 1 being must change or do away with with 5 being 'do more!' or expand that part of the operation. Its a really simple exercise that helps us capture on paper what just happened, when sometimes the season feels like a speeding train and we have just jumped off. What the hell just happened?! So to sit together and organize each our thoughts is really helpful before we take our respite into the wilderness. Once we return and hopefully the snow starts to fly, we sit for hours looking at seed catalogs, reading books and websites about what other small scale, direct market vegetable growers are doing and thinking, then we plan. We make our seed order, this year our plan is to have that done before the end of the year. And then we read some more. Mostly just for fun at this point. Since we miss most of the months other people get to enjoy reading in the sunshine or by the beach. Our days of rest and reading are mostly done under a blanket with a cup of tea. Ahh, sweet rest. Crop Mob Recap. THANK YOU!! Crop Mob on the farm! You have the chance to join us for a few hours of garden fun on Sunday June 1st from 4:30pm to 7pm. We'll provide a desert for joining us! We will meet at 4:30 in the U of I blue parking lot along Sweet Ave near the new Parking & transportation building. We'll carpool from there to one of our farm sites for a couple of hours of a hands in the dirt work party. Many hands make light work!! Thanks to Moscow Food Coop for helping organize this event. It is supposed to be the dead of winter right now. But it feels more like spring some days, with sunshine and a lack of frosty mornings. We haven't had noticeable precipitation in weeks and we're getting a little worried. But we're right where we're supposed to be... We're planning. As part of our farming seasonal schedule, January is the month that we pour over records of last season, make lists of what we want to grow, what we grow because of different markets and our CSA, and drool over seed catalog pictures, knowing that some of those beautiful tomatoes won't taste the way they look in a picture. It's a fun process, reflecting together over what we enjoyed last season and what gave us the headaches. What can we change? What can we do better? What can we do better without? Greg has created a most beautiful masterpiece of a spreadsheet that keeps track of everything. Its so important for market farmers to have a working knowledge of what has been done and what we have to do in our future. Its a living document that is constantly tweaked and referred to throughout our busiest greenhouse seeding months of March and April. Every plant is accounted for, nothing is done in haste. We try to have a game plan. That game plan, when printed out for our trusty field notebook is about thirty pages. While we don't refer to all 30 pages, its all important information that we use in different ways throughout the year. In January, when that spreadsheet is reborn for the new season, we laugh at how this spreadsheet is truly an extension of these farmer brains. You can see a snipit below of our beloved production schedule and how we've tracked it for the last 3 seasons going on 4th. Its jam packed, we know. It tells us how much of what we need to grow to meet the demands of our CSA, two farmers markets, online market, restaurant sales and more. While we know farmers who fly by the seat of their pants, or who know their routine by heart, this is an example of how each farm does things a little differently. We feel having this sort of detailed plan makes ordering seeds easier, determining how much we need to grow to meet our projected income for the year, and in general is makes day to day operations a little more smooth. If you ask a farmer right now what they are doing this time of year, some form of this is likely. So, even if we're not out working in the soil, it doesn't mean we're not busy. We are getting ready and counting the days for the goats to arrive. Today we had the hay delivered and are so thankful to have found a no-spray hay with delivery! And we had the chance to meet another local, like-minded beginning farmer who grows a very nice looking native grass hay just 40 miles away in Kendrick, ID. This is Deirdre (Delilah on her paperwork, but comes from her current owner as Deirdre) and she is a Registered Grade Nigerian Dwarf. She has just returned from her physical exam before she comes to our farm with a clean bill of health. She's about 90 pounds right now and her current owner thinks she's looking like she might be pregnant with triplets. She has had triplets before, delivered and nursed all of them with no help. I anticipate that since this will be my first season kidding goats that I will be quite watchful and spending lots of time in the barn. I think we'll invest in a baby monitor so I can listen for labor sounds without having to get dressed and tromp over to the barn in the middle of the night. This is a view of the barn we are leasing from our neighbor. He built this barn for draft horses and so some modification is needed for livestock on the other end of the size spectrum. 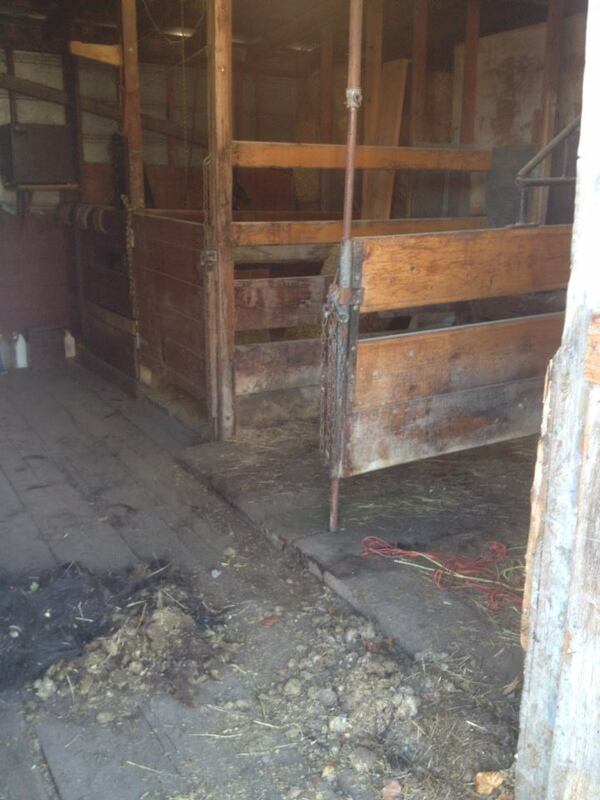 We will be adding stall doors, new hay feeders and moving the milking stanchion in there as well. It has good lighting and even a radio. We are fortunate to live where we do and have access to this kind of infrastructure. We are at the tail end of some extreme temperature lows for the northern intermountain west where we live. Five days of below freezing high temps, and single digit low temps at night are both a blessing and a curse on our farm. The rabbit waters freeze within minutes of putting out, the chickens molt, and the row cover freezes to the ground which means no more greens for us until it thaws. On the bright side, we anticipate these low, low temps to kill off some of the pests we have and in the last few years have had larger and larger populations of. Specifically the Green Soldier Bug or green stink bug (Chinavia hilare) which is a sucking insect that has some pretty detrimental effects on the cosmetic value of tomatoes, peas, beans and other more succulent crops. If populations are high, a significant portion of the crop can be affected. We estimate that nearly 30% of our tomato crop was damaged enough that we wouldn't sell the tomatoes. So as with lemons and lemonade, we made tomatoes into salsa. This winter weather is giving us a chance to sit down and start planning for 2014. The seeds catalogs begin to roll in this time of year, so its easy to start dreaming. One of the important things that we do is to replay the year in our heads and talk about what felt good or what needs changing. We do this causally over coffee or while driving to/from family visits. Its easy to sit down with a notebook of details from the season, look at harvest records, seeding charts and organize thoughts based on that. But its also good to pick out what our feeling were over the season and make changes based on fact and feeling.